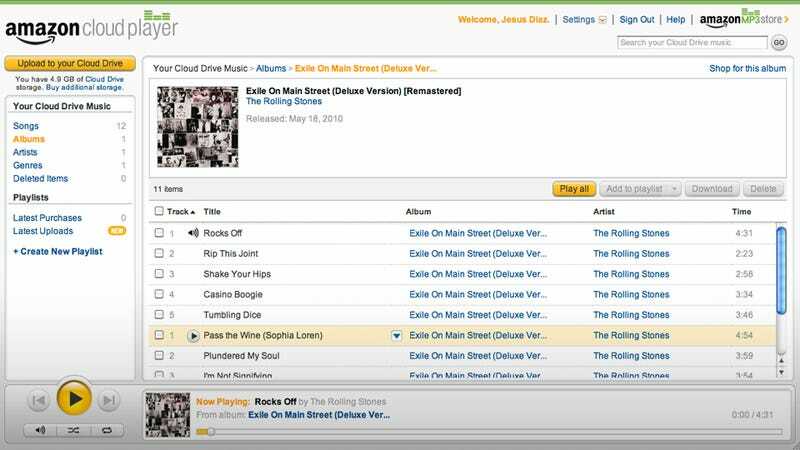 Amazon's taken a leap into the cloud, and they're taking your music with them. But what exactly is Amazon Cloud Drive? And more importantly: how do you use it? You get 5GB of cloud storage, free, that's yours to do with as you please. For some perspective, that's about 1,000 MP3s of middling quality. The focus is clearly music, but you can put documents, photos, and videos on there as well. And going forward, when you purchase music from Amazon, you'll be given the option to save your purchases directly to the cloud to save you the extra step of uploading later. There are seven storage plans available, from the free 5GB all the way up to 1000GB for $1,000 per year. In fact, the pricing structure is dead simple to remember: you pay a dollar per GB per year. Just like you need the Amazon MP3 Downloader to get music you purchase from Amazon into iTunes, you'll need to install the Amazon MP3 Uploader to get it out. It's a quick installation and an intuitive interface that lets you pick which songs you'd like in the cloud based on playlist or artist. And again, it's what lets Amazon access your iTunes library, without which the service would be pretty useless. You can't really argue with "free," but 5GB probably won't cover your entire music collection. That's fine, but sorting through your songs to get just the right cloud-worthy mix could take a whole weekend. You also can't upload songs that are DRM-protected (as in iTunes MP3s from a few years ago) or saved as lossless files. Amazon's hands are tied on the former, and the latter is understandable given those file sizes. Speaking of file sizes—get ready to hurry up and wait. Amazon quoted me 12 hours of continuous uploading to get 5GB of music in the cloud. Amazon's the first major player to offer a service like this, and they're doing their best to get you hooked right away. That means that in addition to the free 5GB, you can tack on 15GB more with the purchase of an Amazon MP3 album. Which means you could put 4,000 songs in the cloud for as little as four bucks, assuming their Daily Deal albums qualify towards Cloud expansion. Moreover, Amazon MP3 purchases—and honestly, you should be buying your music from there anyway—don't count towards your storage cap. That doesn't appear to be retroactive, which is unfortunate for those of us with a bunch of albums from Amazon already, but good to know going forward. It makes sense that you can access the Amazon Cloud Drive from your browser, but you can also giggidy get it on your Android device. That's huge, if you've got a smartphone with limited storage and want to save that space for apps. If you're hoping to access your Amazon locker from your iPad, keep hoping. It looks as though Amazon has blocked streaming through Safari, and the Amazon MP3 app that powers the Cloud Player on Android devices doesn't exist in the App Store (for obvious competitive reasons). You can, however, download songs from the Cloud Drive to your iDevice, where they'll play perfectly—with AirPlay compatibility, even. We can confirm that Amazon Cloud Player does, in fact, work. But whether it was just the connection or Amazon itself, playback stuttered quite a bit—especially on higher quality (256kbps) audio. We've also had some difficulties with subsequent uploads after the initial library scan, so it seems that the entire enterprise has some hiccups to work through. ...that provides a model for iTunes. There have been rumors—so many, for so long!—of Apple moving iTunes into the cloud. And it certainly seems that they're equipped to do so, with a humongous data farm lying in wait in North Carolina. But Apple hasn't pulled the trigger yet, either because they haven't gotten the record labels in line or because they haven't had competition. Amazon Cloud Player potentially solves both of those problems. Clearly Amazon's worked out some sort of deal that has made the music industry copacetic to cloud storage; all Apple would have to do, presumably, is sign on to the same terms. Which is something they'll want to do, surely, now that a competitor with as much clout as Amazon is giving it up for free. Especially since Amazon is also using its cloud storage as a way to drive its MP3 business, which is increasingly encroaching on Apple's iTunes turf.